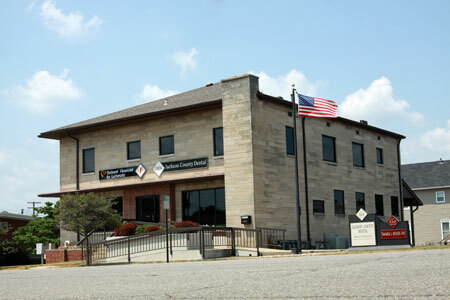 Comfort and convenience are the hallmarks of Jackson County Dental's office operations. To ensure your convenience, below is the information you need about our hours, location, appointment scheduling, insurance acceptance and billing. We know you have many choices when choosing a Dentist in Seymour, IN so we have made requesting an appointment a simple process via our Web site. If, for any reason you cannot keep a scheduled appointment, or will be delayed, please call us as soon as possible. We work with all insurance companies. While we remain independent from most healthcare networks, we do file your claim with all insurance companies. We are happy to assist in the patient's needs for all aspects of maximizing their insurance benefits. We accept VISA, MC and Discover credit and debit cards as well as checks and cash as a form of payment. We are also happy to offer Care Credit as a financing company that can be used for different areas of your healthcare and pet needs. Our office is spacious and a re-designed facility with handicapped accessibility including larger than normal treatment rooms. We offer state of the art digital technology including radiographs and intra-oral photography along with email and texting communication features.